Book series "Decisions of the Arbitration Panel for In Rem Restitution"
The bilingual series "Decisions of the Arbitration Panel for In Rem Restitution" documents one of Austria's most recent compensation measures dealing with the consequences of the National Socialist era. The possibility of in rem restitution of property which was seized during the National Socialist era and is now publicly-owned was provided by the Washington Agreement of 2001. The Arbitration Panel for In Rem Restitution, established with the General Settlement Fund for Victims of National Socialism in Vienna, decides on applications for restitution. For the most part, the decisions of the Arbitration Panel published in this series concern real estate that was confiscated between 1938 and 1945 and was publicly-owned on the Agreement cut off day, 17 January 2001. In many cases, these properties had already been the subject of restitution proceedings after 1945. The opportunity to legally re-examine these measures is a first in Austrian legal history. During the course of these decisions, the Arbitration Panel has developed a complex case law. 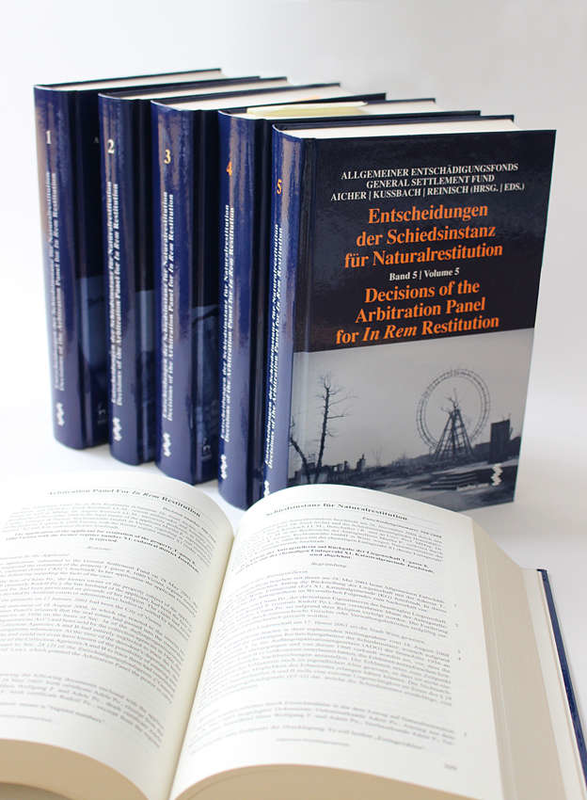 Beyond the decisions of the Arbitration Panel, each volume of this series contains additional material such as the General Settlement Fund Law, a selected bibliography on the subject of restitution and a German/English glossary of legal provisions and relevant specialist terms. Volume 1 also contains the text of the Washington Agreement and the Rules of Procedure of the Arbitration Panel. Volume 4 includes an article on the events leading up to the Washington Agreement and the establishment of the Arbitration Panel, a statistical overview of the Panel's work and the facsimile of the "Joint Statement" of the parties to the negotiations dated 17 January 2001, which preceded the Washington Agreement. Books of the series 'Decisions of the Arbitration Panel for In Rem Restitution' can be ordered via Facultas Publishing or Hart Publishing.